Summary: With his family caught in the crosshairs of a group of brutal killers, detective Cork O'Connor must solve the murder of a young girl in the latest installment of William Kent Krueger's unforgettable New York Times bestselling series. During a houseboat vacation on the remote Lake of the Woods, a violent gale sweeps through unexpectedly, stranding Cork and his daughter, Jenny, on a devastated island where the wind has ushered in a force far darker and more deadly than any storm. Amid the wreckage, Cork and Jenny discover an old trapper's cabin where they find the body of a teenage girl. She wasn't killed by the storm, however; she'd been bound and tortured before she died. Whimpering sounds coming from outside the cabin lead them to a tangle of branches toppled by the vicious winds. Underneath the debris, they find a baby boy, hungry and dehydrated, but still very much alive. Powerful forces intent on securing the child pursue them to the isolated Northwest Angle, where it's impossible to tell who among the residents is in league with the devil. Cork understands that to save his family he must solve the puzzle of this mysterious child whom death follows like a shadow. NORTHWEST ANGLE begins with the O’Connor family vacation being interrupted by a derecho, a unique storm system with hurricane force winds. The vacation in the Northwest Angle of Minnesota on Lake of the Woods had been Cork O’Connor’s idea as a way to bring everyone close to him together in a search of the happiness that has eluded them since his wife’s death two years ago. Things had not gone according to plan and the storm just added more problems. Cork and his daughter Jenny find themselves stranded on a remote lake island separated from his other children Stephen and Anne and his sister-in-law Rose and her husband Mal. While stranded, Jenny discovers a murdered teenage girl and a hungry tiny baby boy and the mystery thriller begins. Cork and Jenny are pursued by an armed invader who appears to want them and the baby dead. Once he gets Jenny and the baby to safety, Cork, a private investigator, is determined to find out the who, what and why of the situation. NORTHWEST ANGLE has a strong religious theme. Rosa and Mal, an ex-priest, are deeply religious and have their Christian faith tested during the midst of the crisis. Cork and Stephen, both part Ojibwe Indian, show their spirituality in dealing with the local Indian elders. Cork must also match wits with a Fundamentalist Sect which believes the end of the world is approaching. 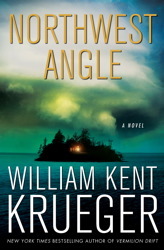 Author William Kent Krueger’s well-defined characters are the main strength of the novel. The principle characters are easy to visualize and have an emotional as well as a physical makeup. The local characters add a nice touch to the story and, to me, embody all the qualities you would expect to see in a small remote community – welcoming, kind, helpful and cooperative. The interactions between Rose and Mel, between Stephen and the Indian elders, and between Cork, Jenny and the baby are well developed and humanize the characters. NORTHWEST ANGLE is a battle of good overcoming evil. The book is an action thriller that combines interesting characters, a beautiful and realistic setting and a great storyline that includes drug traffickers, Indian lure, religious survivalists, double crossers and a family searching for happiness. It is a perfect weekend book for those who enjoy an easy to read thriller. Thanks to the publisher for providing a copy of the novel and to Booking Pap Pap for his review. This is not something that I would read, but thanks for the review. I absolutely adore WKK -- I think his writing elevates the ordinary mystery. I am a couple of books behind in the series (which I've read since the first one) -- but have this one waiting for me. I would have had to look derecho up for WWW! The book sounds like a real page turner. I have this one and I liked the author's previous one okay so was waiting for a review just like this one of course to see if I wanted to hit up the next one!